Somalia – A short history. 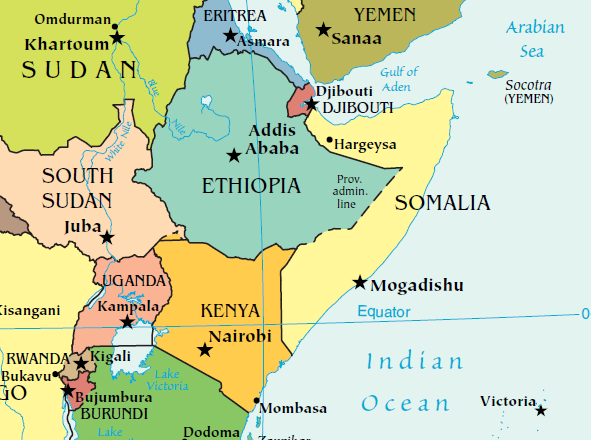 The country of Somalia located in the ‘Horn of Africa’ has been a troubled nation for decades. It has been caught up in the events of the Cold War, suffered through famines, experienced anarchy, dealt with poverty and corruption, and now confronts the Islamic jihadist threat. End of Colonial Rule. 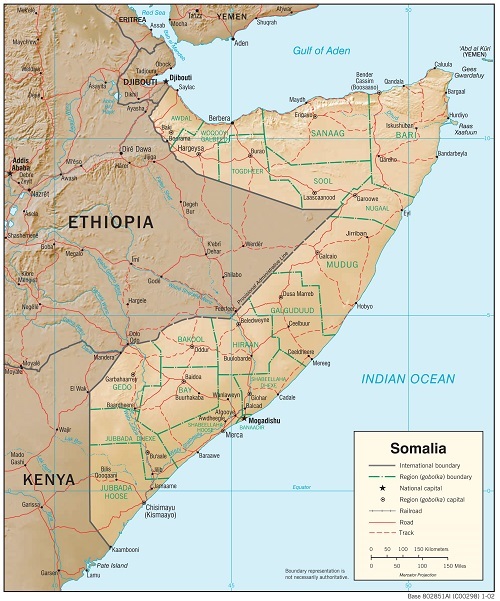 The nation of Somalia is fairly new – established in 1960 from the territories formerly known as British Somaliland and Italian Somaliland. A coup in 1969 brought into power a socialist government – of interest to the United States since it was in the midst of the Cold War. Cold War. For much of the 1970s Somalia was a Soviet client state. The USSR filled the country with 3,500 military advisors from Russia and East German; as well as troops from Cuba and Yemen. In addition, the country was flooded with a wide variety of weapons to include small arms, tanks, and artillery. With Soviet assistance the size of the Somali army was increased from 5,000 to over 22,000. This military assistance and lean to the Soviet bloc helped set the conditions for state collapse and civil war. Humanitarian Crisis. In 1993 the United Nations led a humanitarian mission to alleviate famine conditions in Somalia. The United States took a leading role in this endeavor. Unfortunately, the warlords and the militias the warlords controlled stymied the efforts of the international relief effort. In addition, fighting broke out between the international forces and the militias. The U.S. began a series of raids to capture leaders of some of the militia groups. Engagements between militia factions and the international forces took place in Mogadishu – the Somali capital. One battle over a 24 hour period cost the United States 18 fatalities. The deaths put the Somali humanitarian mission under a microscope and resulted in U.S. disengagement from the mission. Piracy. For several years Somali pirates operating from the coastal areas of Somalia posed a significant threat to merchant vessels transiting the waters nearby. It took a few years and a significant effort on the part of NATO and other countries to reduce the piracy threat. The U.S. Navy was part of this effort to counter the piracy and armed robbery of shipping vessels. Eventually the piracy problem subsided. A Failed State. For the past few decades Somalia has been a failed state. Various governments have come and gone. Some lasting more than others. The country is not unified – with separate regions (Somaliland, Puntland, etc.) operating with various levels of autonomy. Al Shabaab. A terrorist / insurgent group known as al Shabaab emerged in the past several years that has been able to control some of the Somali countryside and mount terrorist attacks in the major cities. Al Shabaab has aligned itself with al Qaeda. There has been some spillover of al Shabaab activity into Kenya – a neighboring country to the south. This has kept the special operations forces of Kenya busy. Islamic State. In addition, the Islamic State has also established a small foothold in the country. This group has the potential to be a rival to al Shabaab as well as pose a threat to the Somali government and U.S. interests in the region. Current U.S. Involvement. The United States – along with other international partners – is working to support Somali efforts to stabilize and rebuild the country along economic, governance, and security lines of effort. The U.S. has a robust presence in the country – with special operations and conventional forces conducting a ‘train, advise, and assist’ mission to professionalize the Somali forces and to stabilize the security situation of the country. CT Mission. Over the past several years the U.S. has mounted raids into Somalia and used aircraft and drones to hit terrorist targets from the air. In addition to these unilateral actions the U.S. special operations in Somalia as well as U.S. conventional forces are engaged in the security force assistance mission to develop the Somalia security forces capability to conduct counterterrorist operations. AMISOM. The African Union Mission in Somalia is a regional peacekeeping mission operated by the African Union with the approval of the United Nations. It was created in 2007 to reduce the threat posed by al Shabaab, provide security to enable the political process at all levels, and to eventually hand over security operations to the Somalia security forces. The United States (through its security cooperation programs) and some European nations are key supporters of the AMISOM mission (funding, logistics, training, etc.). Future Prospects? The African country has been making some progress in the governance arena. AMISOM, although there is the possibility that it will soon downsize, has provided a measure of stability and security for Somalia. International efforts to train the Somali security forces are ongoing but far from complete. Al Shabaab continues to pose a threat to the Somalia government and its people. The conflict with terrorists and insurgents is far from over and will continue for many more years. With continued international support and cooperation – the threats may subside. Maps: Courtesy of the Central Intelligence Agency.